“The flames were chasing us all the way to the water“. 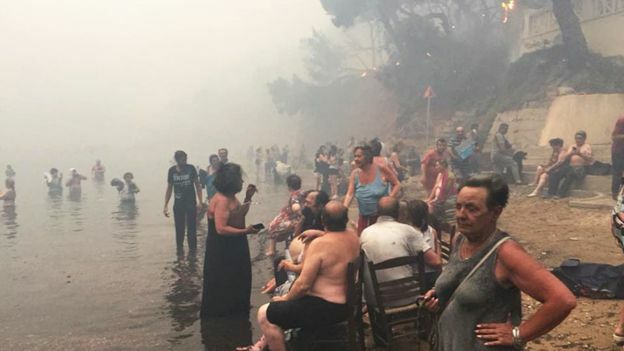 Survivors of the wildfires that have killed at least 74 people in Greece have described how they were forced into the sea by a blaze that “struck like a flamethrower”. 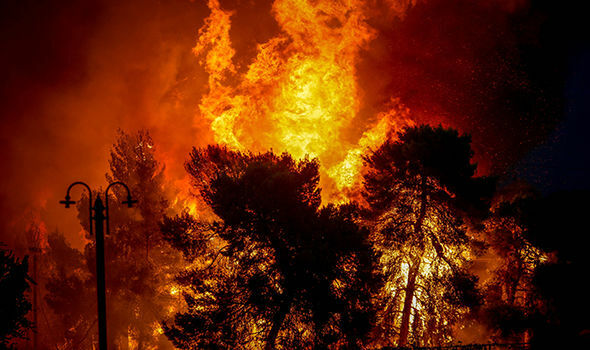 It is Greece’s worst fire disaster since 2007, when dozens of people were killed in the southern Peloponnese peninsula. A number of roads and evacuation routes were blocked by fire and footage of motorists escaping the area shows them driving through thick smoke. 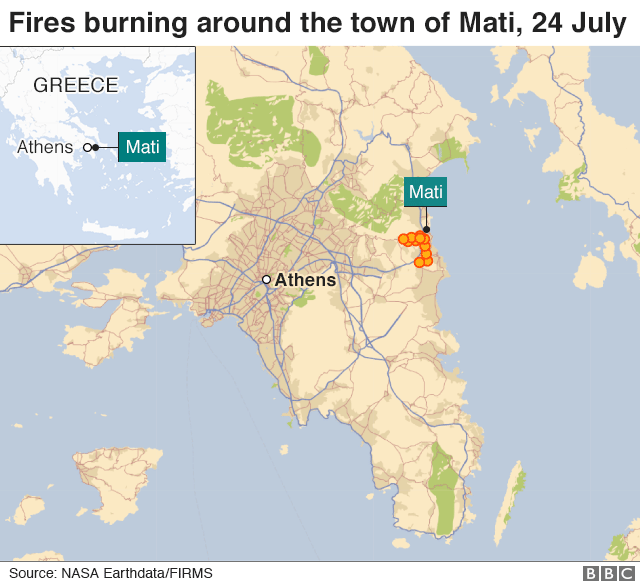 One survivor, Nikos Stavrinidis, told ABC News that despite the air-conditioning in his car, he could still feel the heat from outside as he travelled on a highway. 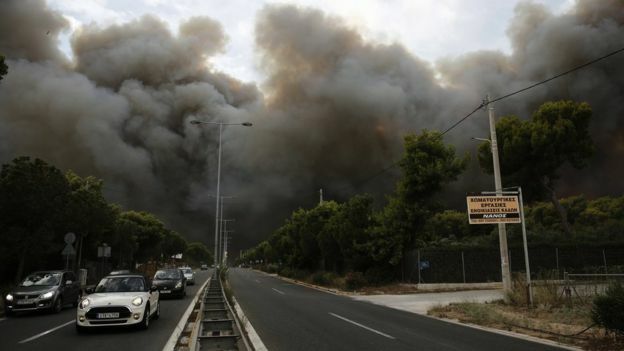 Fire swept through the village 40km (25 miles) north-east of Athens on Monday and was still burning in some areas on Tuesday morning. Desperate families trying to reach the safety of the sea were trapped by walls of smoke and flame. Others died in buildings or cars. 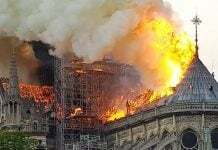 The blaze struck like a flamethrower, he said, causing smoke inhalation and skin burns. Coastal patrol boats and private vessels picked up hundreds of those who did manage to reach harbours or beaches. George Vokas, whose family also escaped by sea, told BBC News that two women he had tried to help had died. “We’re talking about a biblical catastrophe in this wonderful area of Mati,” he said. Fires are a recurring problem during the hot, dry summer months in Attica. 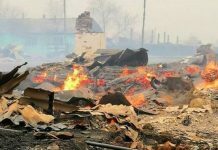 Officials have suggested the current blazes may have been started by arsonists looking to loot abandoned homes. 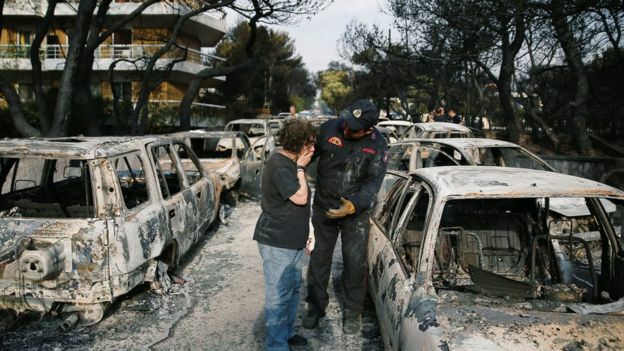 “Fifteen fires had started simultaneously on three different fronts in Athens,” said government spokesman Dimitris Tzanakopoulos. Greece, he added, had requested drones from the US to “detect any suspicious activity“. Fire as described here can be used as a new weapon of mass destruction. Be ready! Get prepared! You can find a strange image showing “burnt cars are neatly piled up” in 14th of image out of 22 on the website above. How can you explain that? Wildfire burnt those cars, and also piled up those cars? 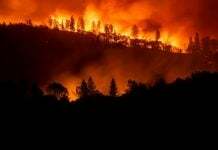 I tell you that Galactic Federation of Light is showing “This is NOT an ordinary wildfire.” They are burning anything owned by Cannibal Reptilians who are controlling this Earth. secureteam10 used my original “Saudi King Hand Shape-shift as a Reptilian” video Which I’ve found on Japanese TV long time ago. Many people were surprised to see Saudi King’s shape-shift. NASA and US military has “Lunar Space Operations Base” on the Moon. But they don’t tell you. Those aliens disguising as humans do not tell you what is really going on. USAF (United States Air Force) Triangular Craft Flying Close to the Lunar Space Operations Base. The video was claimed to have supposedly come from NASA declassified footage though no information was provided from which year the video is from or where specifically NASA got the footage from. I know one guy who worked in this “Lunar Space Operations Base”. He said that people are prohibited to talk about their job on the Moon. He had a recreation room where he could watch TV, and play games like table tennis. He said that he saw a woman who could speak old style Japanese, and her property was surrounded by ancient Japanese antiques. She might be “Princess Kaguya” (Kaguya-hime) used to live Japan in ancient times, and left to the Moon when her space family came to get her. Her story is famous in Japan. 4 letter agency? FEMA? NASA? is doing this torture.They are run by Cannibal Reptilians.